For over 10 years Agence TOPO has created and produced web art works with artists from diverse horizons whose practices and contents lend themselves to multimedia writing. Over the course of the year 2010, Agence TOPO will produce a set of web projects that incorporate a performative aspect and which explore the links between the screen and the off-screen: poetry readings and interpretations, participative performances, interactive arrangements/devices, etc. 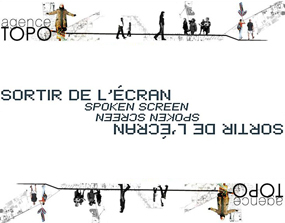 These projects are a follow-up in the series Sortir de l’écran/Spoken Screen, begun in 2007 with Laboratoire NT2 of the Université du Québec à Montréal. This series presents hypermedia works comprising a narrative and performative dimension that fosters visual, audio and textual exploration, both in its physical and on-screen aspects. In order to respect the foreseen deadlines, projects currently under development and those demonstrating a strong commitment from the artists will be given priority. The selected artists and projects will benefit from technical support for a period of 4 to 8 weeks within a residency program that can be spread out over time depending on the artists’ needs and specific project requirements. Artists interested in this theme, and by the production context offered by Agence TOPO are encouraged to submit their proposals.